Hi, my name's Laura and I live with Mandy the cat, who is rescued, and can be a bit special at times. She is very loving and generally calm, but I'm not able to offer sitting services at my home as she doesn't like to share her space (or caregiver) with others! I can provide stable, relaxed, gentle care for your furry friends - with a good dose of playful fun. I've always loved animals from a young age, and have been a vegetarian for many years. In the past my pets have included gerbils, rabbits, guinea pigs, hamsters and fish - and I've spent a lot of time around horses and dogs at the yard too. 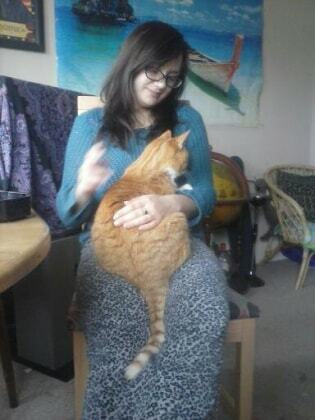 I miss being around more animals, as I no longer ride in London, so being a pet sitter is an ideal way to re-connect with the animal kingdom (and earn some spare cash too!). I'm more than happy to come and meet you and your pet (or pets) free of charge before you made a decision - I know how hard it can be leaving your most precious friend with a stranger, so if we meet I will no longer be a stranger! Its also less stressful for an animal being fed, watered and cared for by someone who they have met before. Services I can offer are care in your home - feeding, changing litter, stimulating play etc, walking and of course providing reassuring photos of your pets wellbeing. I'm quite an active person and enjoy visiting new parks and places, so walking and playing outside together is right up my street. I am a native English speaker living in south London. Really appreciated the care provided by Laura for my cat. It’s great to be able to leave your pet in someone’s hands who does more than just feed them. Very much recommend to anyone looking for a considerate and caring pet sitter. Such an amazing person and Petsitter! Would trust her again in a heartbeat. 10/10, such a caring and trustworthy person.